Bulls, where milk comes from in a very old joke round those parts, has reinvented its small farming town self as the home of puns. Everything has a bull painted on it and a pun – for example, the police station which is ConstaBull. Yes, I know, but I’m easily amused. 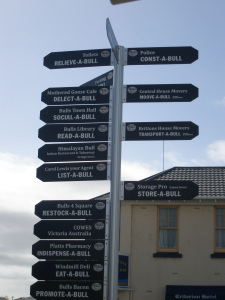 Take a look at the town signpost. Heading out of Bulls I crossed over the Rangitikei River, the big waterway in this part of the world. The track then looped around to cut through private farmland along the river bank – much more interesting than road walking. This is known as the summer route because the farmer closes access to the farm off in winter, which of course they have every right to – it’s very good of them to accommodate us trampers in the first place. The track was rather overgrown in some areas, but I encountered in a timely fashion a group of four Te Araroa volunteers, who had given up their Saturday to come help clear it out again. We had a nice chat, and I continued on my way – the bits not yet cleared were a little confusing but common sense helped me to keep finding markers. 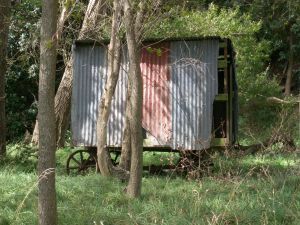 A very pretty walk by the river, complete with what looked like a rusting old caravan in the middle of nowhere. Unfortunately, ran into an electric fence along the way. Now I can’t say that it’s ever been an ambition of mine to find out what an electric fence feels like, but now I know – unpleasant, but not as bad as the time I accidentally stuck my finger in a light socket. Now this is where I got a bit naughty – sorry, farmers. By some oversight, the trail led over an electric fence. Nope, I thought to myself, not again, so I cut across the fields, going quite severely off-track and making my way through fields full of cows. Luckily, animals don’t bother me. Sorry, TA people, but no way was I trying that fence more than once (did try it, briefly, got another shock, swore, and gave up). After this excitement it was a long afternoon’s road walk to Feilding, another small farming town. I have to say, though, that the Manawatu people were some of the friendliest I’ve met on the trail thus far: so a big thanks to the four volunteers who gave me a round of applause for attempting the track; the lady who leapt out of her shower when she saw me looking a little puzzled after the lengthy electric fence detour, and dripping, ushered me into her kitchen and gave me directions, topped up my water bottle, and refused to let me leave without an enormous slice of homemade carrot cake (yum! ); the gentleman at Mount Biggs school who offered to let me use the facilities and get more water; and the lady in Feilding who couldn’t give me accommodation (she was full up) but rang round until she found me somewhere to stay. Lovely people, all.